Women all over the globe are resolving to change an aspect of their lives which is deemed to be troublesome or plaguing such as their current “no good” man, the size of their hips, or the job from hell which provides no satisfaction outside of covering rent and expenses for the month. As January shifts to February and then flowers begin to bud in late March, we often lose sight of our initial goals in the hustle of life. Our dedication to our resolutions begins to wane and losing those 30 pounds seems more realistic for 2013 than right now. Such is life. But, this does not have to be. If we are able to see our goals each morning when we awake and as we wind down each night, dumping the excess baggage seems more appealing and as simple done as said. When Oprah was dominating televisions in the afternoons, she hosted a special on the law of attraction. Based on the self-help phenomenon The Secret, the law of attraction is a theory which states that our thinking creates and brings to us whatever it is that we think about. When we speak or think positively, the universe responds and fulfills our heart’s desires. 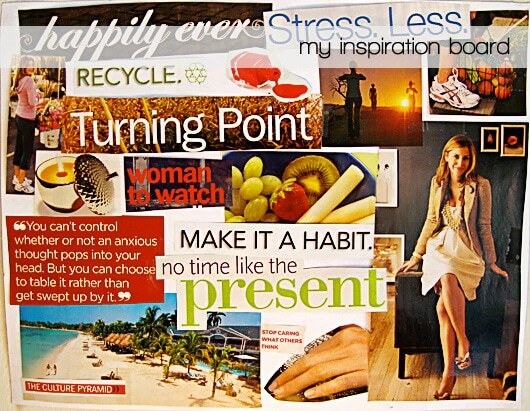 One of the greatest tools available to women as we set our aspirations for 2012 and give them to the universe is the vision board, which serves as a creative outlet for our dreams. It is often filled with magazine and newspaper clippings of letters and objects which are supposed to represent short or long-term goals in our lives. Vision boards are bright, colorful, and attractive – which makes us want to stare at them (I know I do) and soak in what it is we’ve placed on them. They are supposed to be hung visibly because the more you see what you want to accomplish, the easier it seems to attain. But there are rules to establishing an effective vision board that will motivate and fuel us long after our New Year’s Resolutions are lost in the shuffle of our lives. According to life coach Martha Beck, who also serves as a contributor to O, the Oprah Magazine, there are three essential steps that must be followed to build a successful vision board. When flipping through magazines or other resources to find concepts for a vision board, search for unfamiliar and abstract images. Notice what triggers a reaction e.g. a gasp, heart pounding, or a double take and cut that immediately out. Like the lioness who hunts the gazelle, establishing a vision should be natural. Don’t overthink or overanalyze the vision board because it will block what should happen organically. Also, vision boards are not supposed to be created with a result in mind. It is a concept which requires us to realize our deepest desires and vocalize them through art without expectations or hopes. Vision boards should not be considered magical solutions; work must be done to achieve these goals. Plus, goals might not happen as expected – which is the reason that expectations shouldn’t exist. In my 2012 vision board, I have resolved to graduate from college as valedictorian; attend a graduate program that offers me everything I am looking for and then some; be healthier — physically, emotionally, spiritually, and mentally; publish 100 more articles and hone a new journalism skill e.g. magazine designing; publish an article on the Huffington Post, the Grio, and Coco & Creme/Clutch Magazine; establish my website and revamp my blog; focus my writings strictly on the oppression of minority women in underprivileged countries including the U.S.; the challenges facing overweight black women; the economics of fashion; the relationship between the misogyny in hip-hop and the misconceptions of the video vixen; and the actualities in the depictions of black love in films. I also resolve to have an amazing summer with great adventures that I will want to share because they are just that awesome; cultivate new relationships with people who are different than me and can teach me more about life from their perspective; and finally stamp my passport at least twice. But, if I never submitted articles to Coco & Crème, the Huffington Post, or the Grio for consideration, the vision board will not assist me with bringing this dream to fruition. Faith without work is dead, so be alive and dedicated to these goals! Share your vision board photos with us on Twitter @BauceMag.